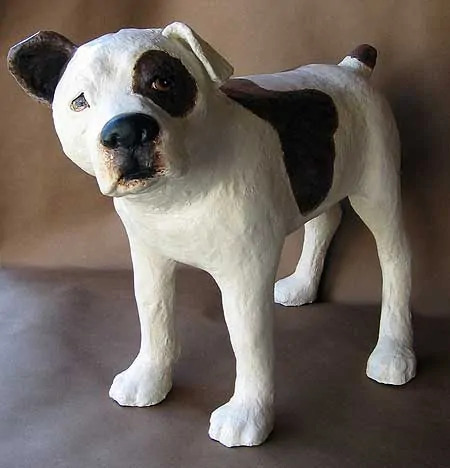 The inspiration for this sculpture came from one of my first websites, which contains many original articles about choosing a dog from your local animal shelter. While I was doing the research for those articles I visited many Humane Society websites as well as taking a lot of trips to the shelter in Portland, Oregon. I found that one of the most common breeds in big-city pounds looked very much like this one. So what kind of dog is he, really? The broken brindle coat seems to imply “American bulldog.” A quick search through the photos on the American Bulldog Rescue website suggests that this term is a euphemism for “pit bull.” Another creative way animal shelters use to not say pit bullÂ is “boxer/lab cross.” In this case, however, our pup might really be part boxer. At least his first owner must have thought so – why else would his tail be docked? This sculpture is fairly large. He’s 17 1/2″ tall, 23″ long and 10″ wide. I used a press-board armature, as I did for the paper mache jackrabbits. I didn’t take photos of the bulldog in process, but he was made using the techniques you’ll find in the panda tutorial. He was finished with a glue/marble dust gesso, natural pigments, and acrylic paint, with a matte finish. As I came close to finishing this bulldog sculpture I realized that he reminds me a lot of a dog we had when I was a kid. Henry J. was a great dog. He could chase balls for hours and he was very polite when I shared my ice cream with him (I don’t think my mother knew we both used the same spoon.) But he did have a few faults. One of them was being a bit too quick to fight when he encountered strange dogs, an embarrassing trait when we camped at State parks. Here’s a sketch I did of Henry J. when I was about 10 years old, a very long time ago. He grew to be about 35 to 40 pounds, but the local animal shelter sold him to my grandfather as a Boston terrier cross. While he was still a tiny puppy we believed it. In truth, he was just a shelter dog, a mutt, and a wonderful family companion. Last week I started out with 5 sculptures in process. I finished the polar bear a few days ago, and I should have the old gray mare done in the next day or so. One of the sculptures I started with didn’t make the cut and ended up in the compost heap (we can’t win them all…), so the last project in this group will be my Australian shepherd. Stay tuned. Now I think I’ll go buy my bulldog a nice red collar. Beautiful sculpture, beautiful story. These dogs are underrated for sure. The “bad news” about them as a whole doesn’t help. Thanks for posting this with such a tender explanation. I’m currently sculpting a realistic life size beagle. Do you have any technique or method to suggest for eye placement and positioning? Thanks for any help. Hi Elizabeth. The best way is to look at a real beagle from all sides and from above, so you can get a feel for the way the eyes fit in the skull. You can also do a Google image search for a beagle skull, and then build the skull out of crumpled aluminum foil as part of your armature. If you get the bones right, the eye placement will be easy. Easier said than done, of course. You might need to do some experimenting, putting the eyes in and then checking from all sides to see if it looks right. If not, keep moving them until you like what you see. Then add the paper mache. That’s my usual method. Because we are not seeing true real life dimensions or weight, this could be a true American Bulldog( not presently recognized by the AKC, and much bigger than the English Bulldog that IS recognized by the AKC). There are 2 types of American Bulldogs( or AMBULLS as rescue people refer to them as) in the USA- one looks very bulldoggy- known as *THE JOHNSON TYPE* and the other looks more like a pit bull. In shelters, the ones that look like a pitbull get lumped in with the dogs that are pitbulls, due to such similar looks and a lack of breed knowledge by shelter employees. Boxers are a breed I know well and I see shelters label so many dogs a boxer mix just because they see a fawn coat and a white stripe down the face. As you mentioned Jonni only a few breeds have a docked tail- boxers are one of them. As for your childhood friend, not a stretch if he was a Boston mix, but nowadays we are seeing a lot of *oversized Bostons*- as in, they are NOT the weight size as referenced by the AKC Guide- but larger, like your childhood pal. I , too, had a Boston growing up also and he was the greatest and most loyal pet! But he was also a bit of a handful when encountering other dogs. Like yours! He was raised with one other dog, so he had a disdain for all other dogs of any size and was ready to start scrapping just for the sake of scrapping! ( Dog trainers now often say this ornery behavior a dog has ,among other dogs is due to a *lack of proper socialization with other animals* ). All of the breeds you mentioned are dogs I would love to sculpt in paper mache’! How nice it would be ( if they came out as lovely as I wish ) to then auction them off for a rescue org for fundraising purposes! Excellent info, Janni. And the auction is a great idea. I’ve participated in two of them, for a greyhound rescue group. It was fun to be involved. Help me . 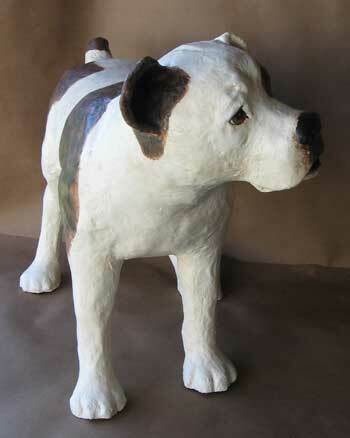 Can you tell how to make a big paper mache bulldog plese.Can you send a video to me plese. I love this bulldog! I only recently stumbled upon this website and love it. 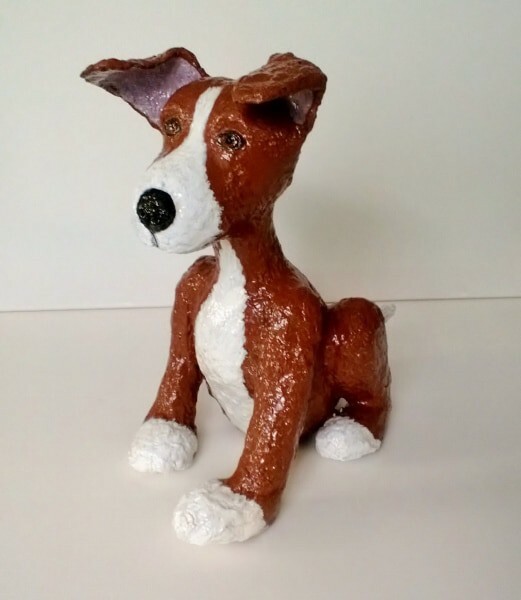 I was inspired enough to whip up some paper mache clay and make my own paper mache dog. I will say that, in my impatience to create, I didn’t use cardboard patterns like you suggest, and as a result the legs are disproportionately large, and look like things I just stuck to the sides of the body (which I did). Also, I used semi gloss polyurethane (it’s what I had on hand) to seal it, which is way too shiny Lessons learned, and I hope to get better with my future animals. Thank you Jonni for sharing your expertise! p.s. meant SKETCH not SCATCH!! As always, amazed at your lovely work. The scatch you did at 10 yrs old of your ole faithful pooch is incredable. I don’t know many 10 yr olds who could draw that well. A true artist in the making “way back when”. Thank you again! Looking forward in seeing more. Still cold in Sweden…. Wishing for some of that OR heat!!!! We’re still waiting for some Oregon heat, too, Sprinda. Although I admit it did get up to 46F today. I guess it’s all relative, right? I think I was actually referring to another photo of five sculptures you were working on in your covered patio (?) area and you could only work on them till around 8:00 a.m. when it got too hot to work further. I quess I got my stories mixed up, scanning lots of your “pages”. Funny, that sort of made me feel better that you all (guys) are only at 46F, haha. But you have had some nicer weather already right? Once spring really hits here in Sweden, its beautiful!!! Living here with my Swedish husband. The wild flowers are the most amazing things. 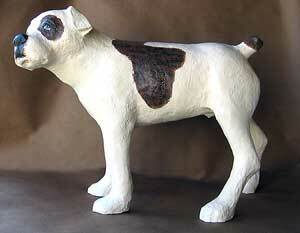 I do have a dog pattern, which is part of my new paper mache book. In fact, I put the dog on the cover. I don’t have a dog pattern available on this site, however. You can also follow the instructions in the book to create a dog pattern of your own. I function with these dogs and as far as animal behavior goes, I am a solid believer in nurture and training. I have met Jack Russell Terriers that I wouldn’t go close to again, but have for no reason had a poor expertise with an American Staffordshire Terrier. If you’re talking about their owners- nicely, which is a distinct story. Humans are creatures as well, and we tend to each have our unique strategies about “moral concepts”. I agree – almost. I did meet an English Staffordshire that was born excessively nervous – a dangerous trait in a dog with such big teeth. He was never mistreated (he was my mom’s dog). I also know a girl who was permanently disfigured by a pit bull (and a little boy who was bitten in the face by a cocker spaniel…) – poor temperaments can be bred into any breed, even the little cute ones, as you mention. But I grew up with bulldogs, and if they’re treated with the respect they deserve, they make good companions. And they are beautiful dogs. wow. thats gorgeous. looks like myy dogg. i lovee itt. can you tell me how to make that. i have to do something for art class like this and i wanted to make something like this but i dont know how to. so can you lett me know how? i wantta make something creative. Just check the tutorials on this site, and use the techniques for your dog. Then let us see how it turns out! Do you ever sell your sculptures?? Very nice sculpture. I enjoy the way you cature expression. One note though, as a American Pit Bull Terrier aficianado I have to coment. The American Bulldog is a breed of its own and is not another term for Pit Bull. He’s adorable! I’m a fan of the “bully breeds” (one is snoring at my feet now), and I instantly recognized that expression and stance even before you finished him. My three year old just walked up to the computer and said “Look Mommy, it’s Medic!” (thats the snorer’s name). Well done, he’s definately the all American Dog! I wish more people appreciated these guys.